Biology I Flora. All living things depend on energy What is energy? Energy – ability to do work Energy is needed in different amounts at different times. 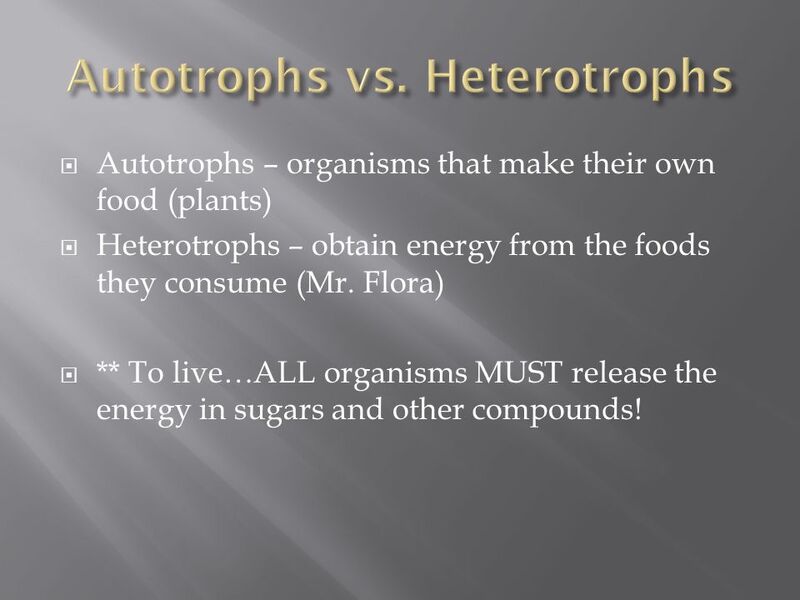 3 Autotrophs – organisms that make their own food (plants) Heterotrophs – obtain energy from the foods they consume (Mr. Flora) ** To live…ALL organisms MUST release the energy in sugars and other compounds! 7 How is energy released? 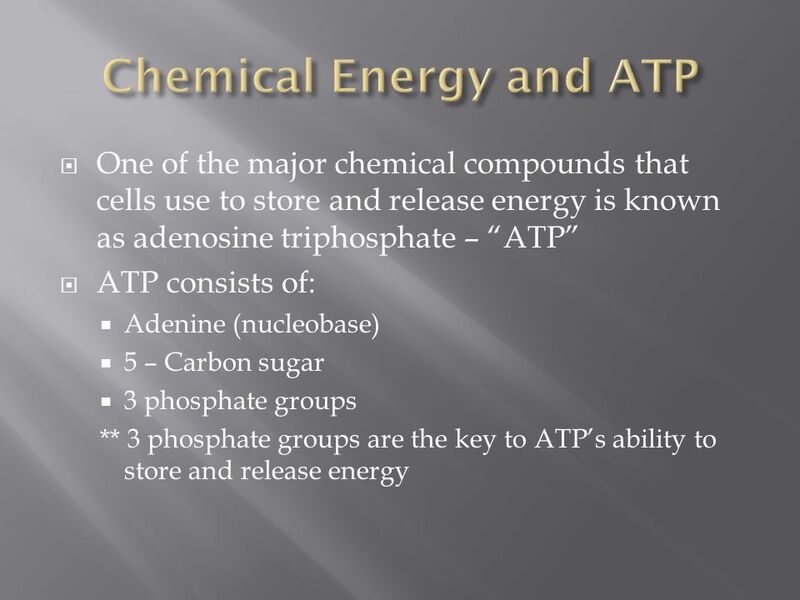 By the breaking of the chemical bond between the second and third phosphate groups Cells have the ability to remove phosphate groups when needed to provide energy Ex: ATP powers cellular activities ** Characteristics of ATP makes it very useful as the basic energy source of ALL cells! 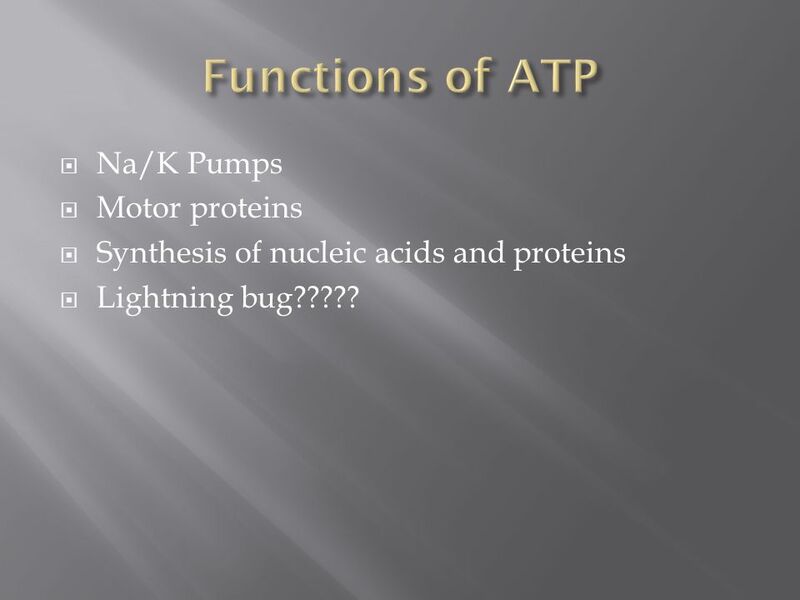 8 Na/K Pumps Motor proteins Synthesis of nucleic acids and proteins Lightning bug????? 9 Are cells loaded with ATP they can use??? No!!!!! 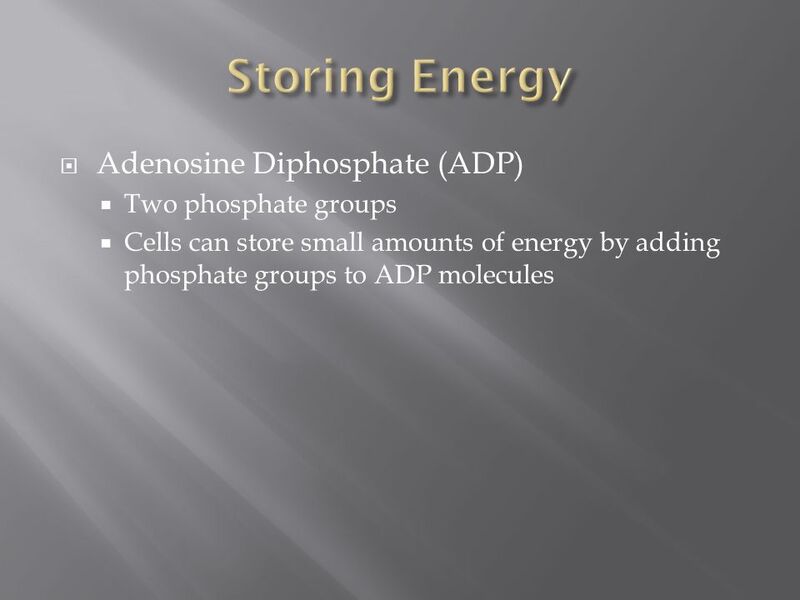 ATP is a good molecule for transferring energy, but NOT a good one for long-term storage A single sugar molecule (glucose) can store more than 90 times the chemical energy of ATP. 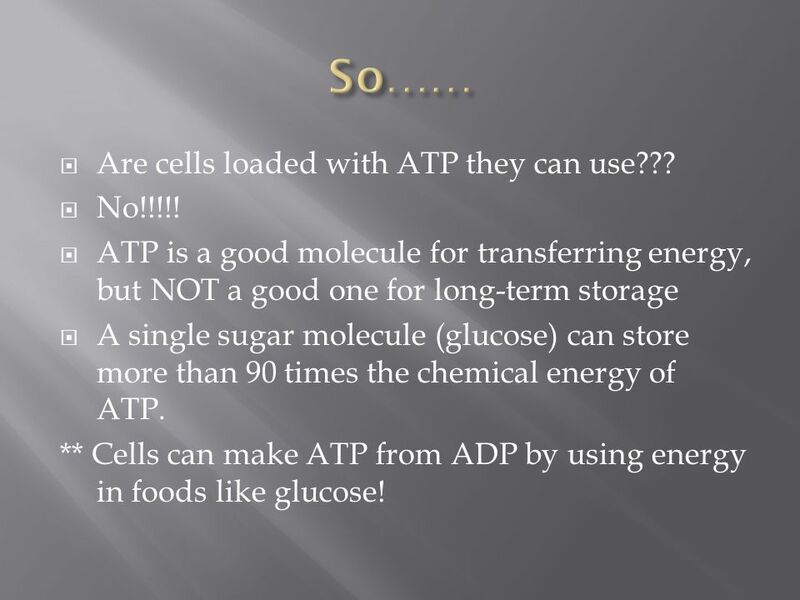 ** Cells can make ATP from ADP by using energy in foods like glucose! Download ppt "Biology I Flora. 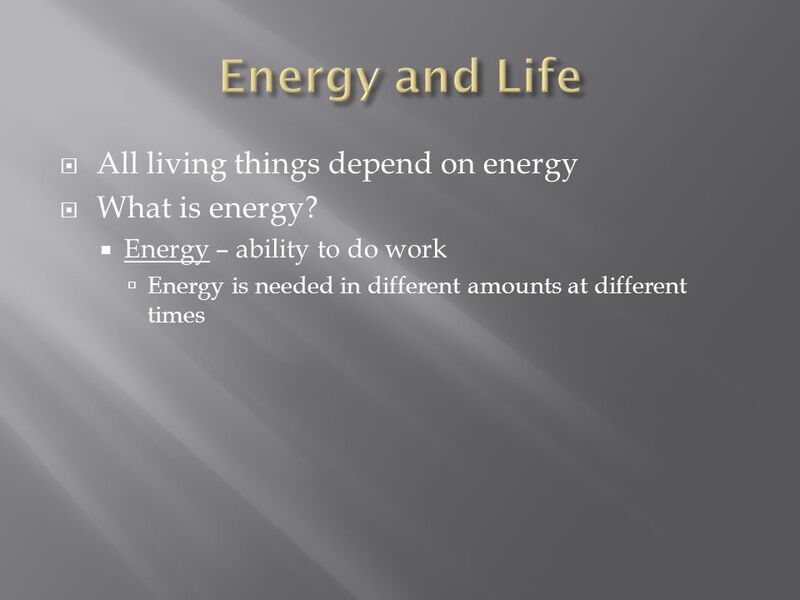 All living things depend on energy What is energy? Energy – ability to do work Energy is needed in different amounts at different times." Science AHSGE Standard II-1, part 2- Photosynthesis and Cellular Respiration. Chemical Energy. Organisms get energy by consuming food. From the food that is consumed, organisms obtain macromolecules that are broken down into a chemical. 4.1 Chemical Energy and ATP KEY CONCEPT All cells need chemical energy. Warm up Oct. 30 How do animals get energy? What about plants? Energy of Life. Why do Cells Need Energy? To maintain homeostasis For growth and development For the movement of materials For the building/breaking down. Unit 7 Cell Processes Essential Question: How is matter transferred or energy transferred in living systems? End Show Slide 1 of 20 Mr. Karns Energy and ATP. End Show Slide 2 of Energy and Life. Energy and Life Chapter 8.1. Slide 1 of 20 Copyright Pearson Prentice Hall 8-1 Energy and Life. 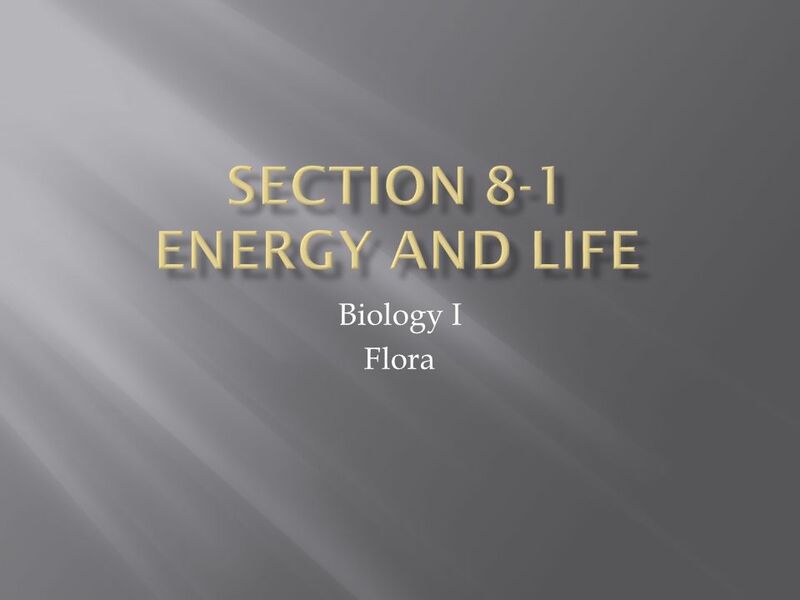 8.1 Energy and Life Biology. 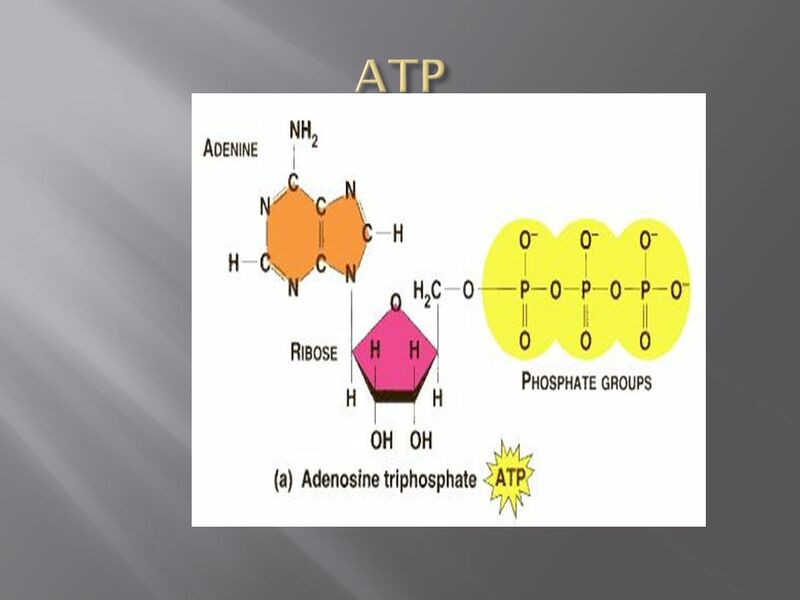 1 Review What is ATP and what is its role in the cell” Explain How does the structure of ATP make it an ideal source of energy for the cell Use Analogies. End Show Slide 1 of Energy And Life Copyright Pearson Prentice Hall Chemical Energy and ATP Energy comes in many forms including light, heat, and. 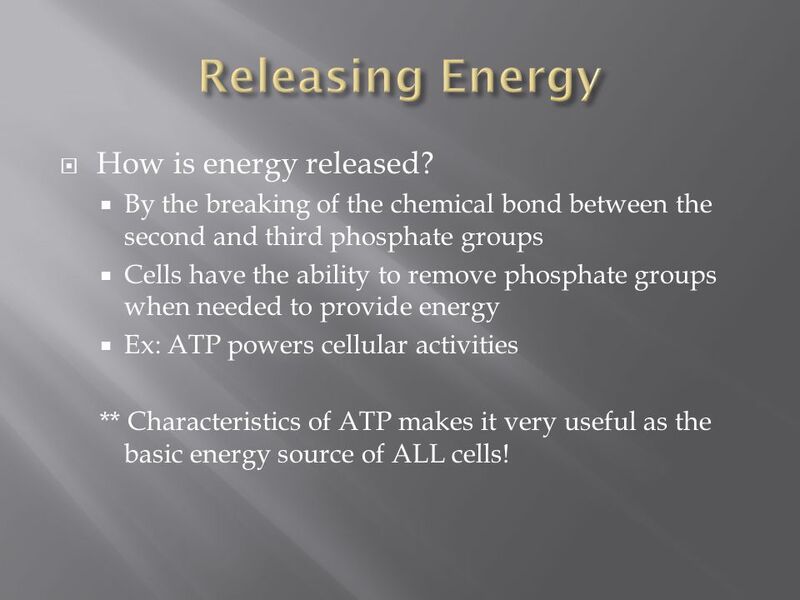 KEY CONCEPT All cells need chemical energy.